Financially inclusive India! Are we? Home > Coverage > Financially inclusive India! Are we? The 2017 Global Findex Database of the World Bank Group portrays India in a remarkably favourable light owing to the sharp increase in the number of bank account holders in the country, but the underlying truth makes this progress appear awfully hollow. The recently published World Bank Group report- Global Findex Database 2017 consists of a comprehensive dataset which measures the financial inclusion of more than 140 economies around the globe. The financial inclusion can be considered as a key lever to reduce poverty and achieve inclusive economic growth. When people participate in the financial system, they are better able to start and expand businesses, invest in education, and manage risks. Yet, as of 2014, two billion adults remained unbanked. The report displays statistics which put India in a fairly soaring position in terms of the number of adults owning a bank account, which was made possible because of a strong government push. Globally, the share of bank account holders has risen to 69 percentage points which is 7 more percentage points as mentioned in the last report of 2014 and the overall account ownership figures continue the upward trajectory since the release of the first Global Findex Database in 2011 which showed 51 percentage points. The report mentions that the Indian share of account ownership has been more than doubled to 80 percentage points since 2011. Particularly, the time span between the years 2014 and 2017 has seen a significant climb of more than 30 percentage points among women as well as adults in the poorest 40 percent of households. Among men and among adults in the wealthier 60 percent of households too, it increased by 30 percentage points. According to the government data sourced from the banks, the total number of Jan Dhan account holders has risen from 281.7 million in March 2017 to 314.4 million in March 2018. However, on speaking with people involved in Indian banking sector, their experiences suggested and repeated that numbers are deceptive when you overlook the ground reality. Mr Akhil H P has been working as an Assistant Manager with Union Bank of India in rural Karnataka. The total number of current and savings accounts in banks has risen from 1.22 billion in March 2015 to 1.57 billion in March 2017. The report states that about 514 million accounts have been opened globally from 2014 to 2017. However, it is heartening to see that of these 514 million accounts, the number of Jan Dhan Accounts opened in India during the same period is about 28.17 crores, constituting almost 55 percent of the accounts opened globally during this period. 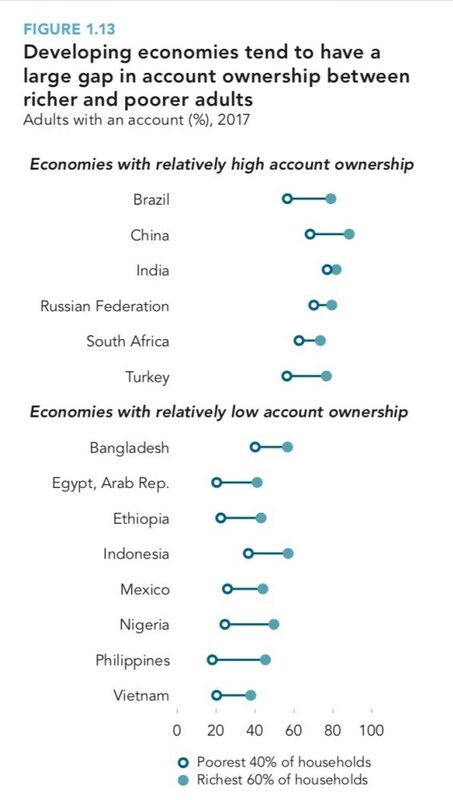 Further, the report takes cognizance of the “dramatically increased account ownership” in India and reduced gender gap in ownership by six percentage points vis-a-vis 2014 with 83 percent of the men and 77 percent women now having an account. Moreover, among MUDRA loan beneficiaries, women account for almost 75 percent. Given the above statistical figures, India’s achievement clearly proves to be commendable, portraying a positive picture towards the country’s financial developments. Today, India’s gender gap has shrunk to 6 percentage points thanks to a strong government push to increase account ownership through biometric identification cards. The consequent decline in currency in circulation was mirrored in a surge in bank deposits. Between, October 28, 2016 to January 6, 2017, notes in circulation declined by about ₹ 8.8 trillion, which in turn, was largely reflected in an increase of about 4 percentage points in the share of Current Account and Saving Account (CASA) deposits (low cost deposits) in aggregate deposits of the banking system. Demonetisation also led to a significant increase in financial intermediation with 48 percent increase in deposits in Pradhan Mantri Jan-Dhan Yojana (PMJDY) accounts, with an addition of 18 million accounts post-demonetisation. “Going by just the numbers of new bank accounts is misleading to understand the banking scenario in the country. We need to look at the way people were forced to move into the banking system and digital transactions through demonetising 86 percent of cash overnight, even when the informal sector accounts for 90 percent. While pushing them in that direction, lakhs and crores of rupees was allowed to go waste in the form of non-performing assets, which is near to Rs 10 lakh crore by now, causing loss to public money. The new bank accounts meant more money to the rich corporations. The numbers did not translate to the betterment of people.” Joe Athialy Executive Director, Centre for Financial Accountability, India. In case of South Asia, the progress was driven by India which brought a shift from 23 percent to 70 percent with big gains among big women and poor adults. 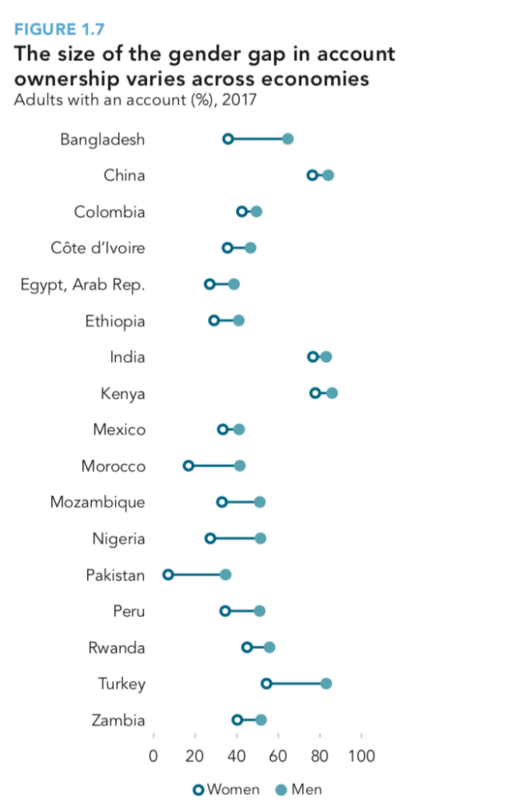 In Bangladesh, the share with an account rose by 10 percentage points among women while nearly doubling among men. Regionwide, digitizing payments for agricultural products could reduce the number of unbanked adults by roughly 40 million. If we take Central Asia into consideration, account ownership raised from 58 percent of adults in 2014 to 65 percent in 2017. Among those with an account, 17 percent opened their first one to receive government payments. Digitizing all public pension payments could reduce the number of unbanked adults by up to 20 million. The same was the case in Europe too. In East Asia, 71 percent of adults have an account, little changed from 2014. 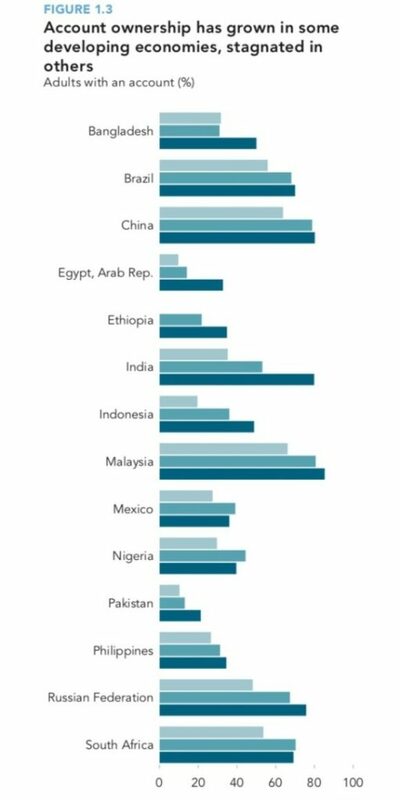 Gender inequality is low: men and women are equally likely to have an account in Cambodia, Indonesia, Myanmar, and Vietnam. 405 million account owners in the region pay utility bills in cash, though 95 percent of them have a mobile phone. Surprisingly, PM Narendra Modi’s ‘Digital India’ campaign wave caught the pace, but its actual translation into reality remains a far-fetched dream. The article, published originally at Delhi Post, can be accessed here.